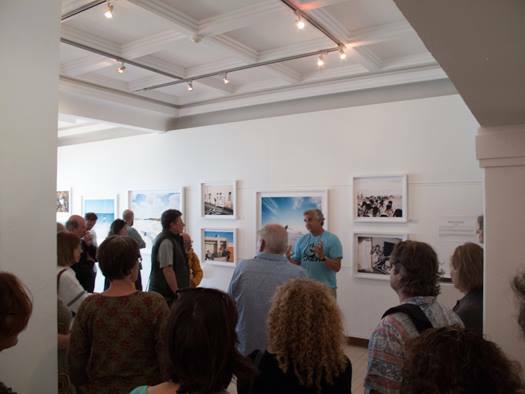 The Beyond the Beach Exhibition opened opposite from the waves at Muizenberg’s Surfer’s Corner at the Casa Labia Gallery on Sunday, 21 September and ran to 21 October 2014. Curated by Paul Weinberg, the exhibition features several photographers whose work re-imagined the beach and shoreline of False Bay as space for ways of seeing the fluidity of identities, emotions, spaces and aesthetics associated, evoked or juxtaposed to the “beach” as place and concept. I was invited to participate in the exhibition and create an art installation that critically explored South African surfing histories (see note below for more details). 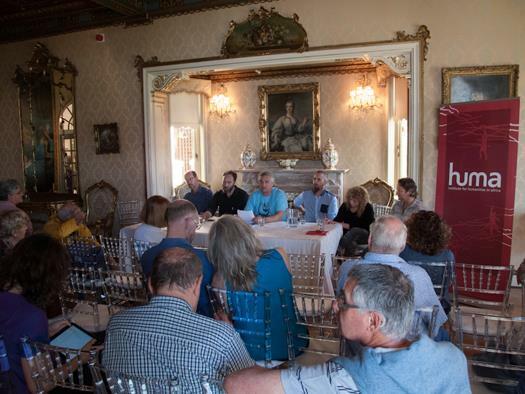 Exhibitors on display: HUMA hosted panel discussion on the Beyond the Beach Exhibition, Muizenberg and the raising questions about the beach as a space opening the possibility of inclusivity and belonging in post-apartheid South Africa. Held in at the Casa Labia ballroom, 12 October 2014. (L to R: Rodger Bosch, Sean Wilson, Paul Weinberg, Robert Hamblin, Jenny Altschuler and Glen Thompson. Not pictured, Sandy Worm, who is based in Germany). Photo: Casa Labia. Surfing pasts becomes somewhat knowable through traces, found fragments providing a view of what happens beyond the beach in the waves. This art installation was a reflexive review of my place within my studies of South African surfing history. Part summation of my doctoral dissertation in History (the exhibition run during the final month of my writing up of my dissertation), part visual representation of some of the key sources and themes informing that historical study, this installation was a becoming for me as a surfer and historian, a space for me to speak as a cultural practitioner to my interpretations of the beach and surfing’s historical place therein. 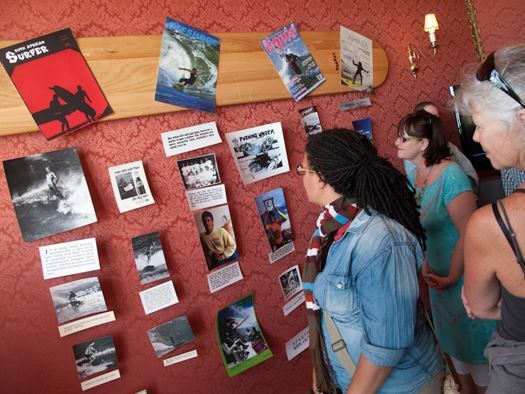 The selections from the magazines on display come from independent South African surfing magazines no longer in print, South African Surfer (1965-68), Offshore (1987-89), and Liquid Girls (2005-6), or in the case of Amaza (2012 – ), currently in print but not widely available. All found a publishing home in Cape Town; South African Surfer moved from Durban for its last issue. The earlier magazines folded due to market pressures, Amaza is published by Waves for Change, a local non-profit organisation that uses surfing for leadership training and social development for at-risk youth from Masiphumelele and Khayelitsha townships in Cape Town. Each magazine reflects turning points in South African surfing history and points to the shaping of the diversity of surfing identities in the present. South African Surfer provides a record of the Sixties surf boom in the longboard era, Offshore reported on non-racial surfing under apartheid, Liquid Girls made girl and women surfers visible in a market over-determined as youthful males, and Amaza brings to the fore the lives of black surfers and emergence of township surfing. Framing the surf magazines, the broken surfboard speaks of the how the shortboard is no longer the only way of finding pleasure when riding waves. It was provided by Share the Stoke Foundation South Africa, which repairs and re-deploys surfboards into local surfing development programmes. This surfboard was beyond repair and was last used at the Surfshack Surf Outreach Project in Muizenberg. The wooden Alaia Needle surfboard, shaped by Muizenberg based WAWA Wooden Surfboards, guides the chronology of the installation, from the Sixties to the present. It also references surfing’s precolonial Hawaiian past, that surfing has traveled the globe in the modern era, and gestures to the future of surfboard shaping in seeking alternative and environmentally-friendly materials to surfboards made out of petrochemical based epoxy, polystyrene, polyester and polyurethane products. The UCT documentary film, Berg Boys (2013), brings Muizenberg into focus as a space for passing on surfing styles and know-how from a surf coach to a young grom in keeping the surfing stoke alive. The film brings to the fore the role of surf tourism in providing employment to black surfers and provides a view of how surfing keeps youth off the streets and in the waves. My installation shared a room with Sandy Worm’s portraits of some of Muizenberg’s black surfers, titled: Black People Don’t Surf. The details of this photographic project, and the others that were on display at the Beyond the Beach Exhibition are detailed in the catalogue archived on the Casa Labia Gallery website.